The men’s and ladies alterations service I tend to offer are mainly shortening legs, with the original finish retaining. When asked for the heal kick tape, slant to heal again if requested, taking in the waist area stripping down the seam and making as near original as possible, tapering the thigh area of your trousers, tapering the bottoms to make a more fitted leg or even the new type fashion of altering to make ultra tight fitting bottoms (skinny type fitment). Please view the below video i filmed to quickly go over suit alterations and more specifically jacket alterations. Taking in the side seams of your jacket: To make a more fitted style, if the jacket is a dated look of a more ‘boxy’ straight side seam look and you want it with more a tapered cut into the waist line. Let out the side seams of your jacket: You may have bought the jacket and found it to be a little tighter than wanted. You may have put on a little weight and now the jacket feels uncomfortable. We can let out jackets by around 1″ – 2″ depending on how much fabric the manufacture has left inside. Shorten Sleeves of your jacket: Be it a plain ladies type cuff or a mens jacket with buttons and button holes. On some occasions it is possible to shorten from the sleeve head to retain all the original detail present, this is a more time consuming way of altering your sleeves. But this will retain all original detail even if it has a working button hole cuff. Lengthen Sleeves of your jacket: On most occasions we can lengthen your sleeves by 1″ – 2″ depending on how much fabric the manufacture has left inside. The lining may need to extended if its being lengthened more than 1″. The cost does go up slightly for this to be carried out. Shorten Length of your jacket: We can shorten your jacket be around 1″ – 2″, with shortening the length you need to bare in mind the length of jacket compared with the pocket balance. You don’t want to go too short as the pockets on the front of the jacket will start to look slightly odd in relation to the jacket length. Chip Shoulders: We can take in the shoulder width on you jacket by around 0.5-1 inch per shoulder, so up to 2 inches in total if you measured the complete back width. This is normally enough even if you have lost a significant amount of weight. Pick up rear neck area: If you have a slight high or low shoulder line compared with others, you may suffer with the rear upper part of your jacket having a crease and therefor an unbalanced appearance, we can lift or drop this area to get rid of this. Taper Sleeve width: On some occasions we get requested to taper the sleeves width. 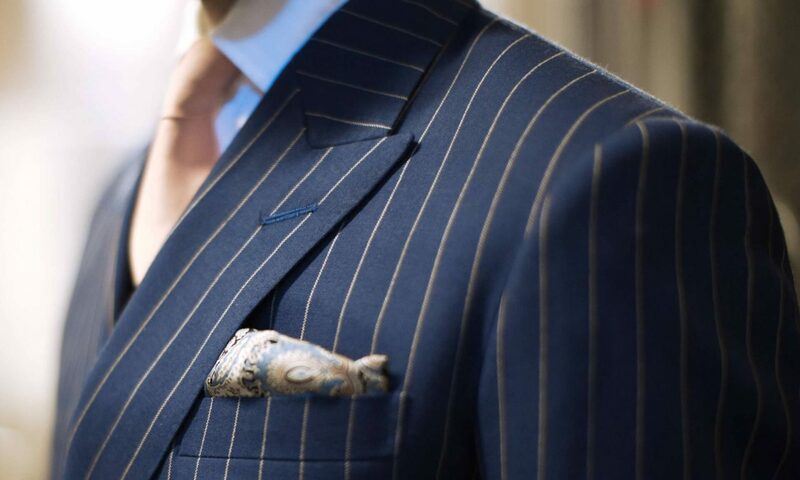 This is sometimes carried out along with tapering the body side seams of the jacket to keep the complete balance of the suit if the jacket and trouser have been taken in lot more than standard. You may decide you also want this service. Reline Jacket: We can put a brand new inner lining into your old jacket. It may have been of a poor quality when bought new and worn threw prematurely or has just worn threw with general wear and tear over the years. If the jacket is still in good condition it may be worth considering getting us to put a new lining into your jacket. We also have a superb collection of satin linings with over 50 colours to choose from, typical black, grey, navies along with some beautiful pinks, purples, yellows etc… We even have some polka dot ones on request. All inner pockets can be retained on request. Samples can be sent by post if required. This was an interesting one we recently did for a customer who is a huge fan of Manchester United football club. Lined the jacket with the football shirt from the club. Please watch the following video for more in depth break down of the work that can be done to a jacket. Shorten Leg Length: Be it 1″ or 10″ you need them shortening we can do it. We will replace all stitching back to the manufactures finish, replacing all internal stitching and overlock stitching to the same as before it had been altered. We can also add the heal (kick) tape onto the inside of the trouser hem for added weight and to stop the bottom of the hem from wearing away on the rear of your shoes. Lengthen Leg Length: In most cases the manufacture leave in an inlay of around 2″ for us to let down. So if your trousers are half mast and showing off your socks a little, we can certainly let them down for you. On most occasions there is not enough room inside for the heal (kick) tapes to be added (replaced). Take In Waist Area: We can take in trouser waists be up to 4″. The only thing you have to watch out for here is that the rear pockets don’t meet. This looks very odd and is unconfortable once altered. The lower seat area can also be taken in if requested. Let Out Waist Area: In most cases the manufacture leaves in an inlay of around 2″ for us to let out. So if your new trousers are slightly too tight and need a touch out, or you have put a bit of weight over the Christmas period. We can definitely alter those for and make you feel a lot more comfortable in your trousers. Taper Thigh Area: We can taper the thigh area in for you, if you would like them more fitted. Make Skinny Cut: With some suit trouser being around a 14″ bottom as standard, we can amend any old or new trousers with a wider leg pair down to around a 14″ bottom on request. We take special care to make the leg not look like its been altered, to retain the cut of the leg to be graduated and look as if its never been altered. Lift Crutch Area: Every now and then we get this request, when for some odd reason a suit trouser has been cut with slightly longer crutch than normal, we can alter this and remove the excess underneath. Please check the gallery page for examples of all the above mentioned mens and ladies suit alteration services we can offer you. Please watch the following video for more in depth break down of the work that can be done to trousers.